Right up until it develops a conscience, The Campaign is a very funny comedy about a congressional election that pits a slick, empty-headed congressman named Cam Brady (Will Ferell) against an unlikely opponent (Zach Galifianakis). Under the guidance of director Jay Roach, The Campaign is at its best when its being preposterous, lewd and blatantly outrageous. Cam has had a lock on his North Carolina seat in the House for years. But Cam’s re-election bid (for a fifth term) hits the skids when he’s caught making an obscene phone call to one of his mistresses. Cam’s speeches emphasize America, Jesus and freedom, but even such default cheerleading may not save him this time around. 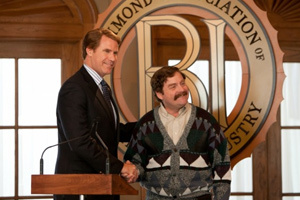 Sensing vulnerability, a couple of kingmakers — the billionaire Motch brothers (Dan Aykroyd and John Lithgow) — handpick Galifianakis’s Marty Huggins as the GOP challenger to Cam, a Democrat whose years in Congress have turned him into a cipher. Jokes trump party affiliations with Galifianakis playing his character as a mincing, effeminate man who’s tutored in the rough side of politics by his ruthless campaign manager (Dylan McDermott). Marty’s married with children, but seems more devoted to his two pet pugs than to his family. Best not to reveal too many of the jokes, but the movie plays with a variety of stereotypes, most hilariously with a maid who works for Marty’s dad (Brian Cox). And there’s humor and bite in a debate scene in which Marty challenges a bumbling Cam to a task that stymies him: reciting the Lord’s Prayer. All well and funny, but the screenplay becomes significantly less amusing when it tries to sharpen its satirical edge, making obvious points about the injection of big money into politics. The Motch brothers, of course, evoke the real-life Koch brothers. Not content to stop there, the script takes a misguided Capraesque turn in its third act, again proving that sincerity and comedy don’t necessarily make good bedfellows. Clocking in at a mercifully fleet 85 minutes, The Campaign fizzles before it’s done, but when it’s funny, it’s a lot funnier than most of this summer’s comedies. Is it possible to cast a positive vote for half a movie?